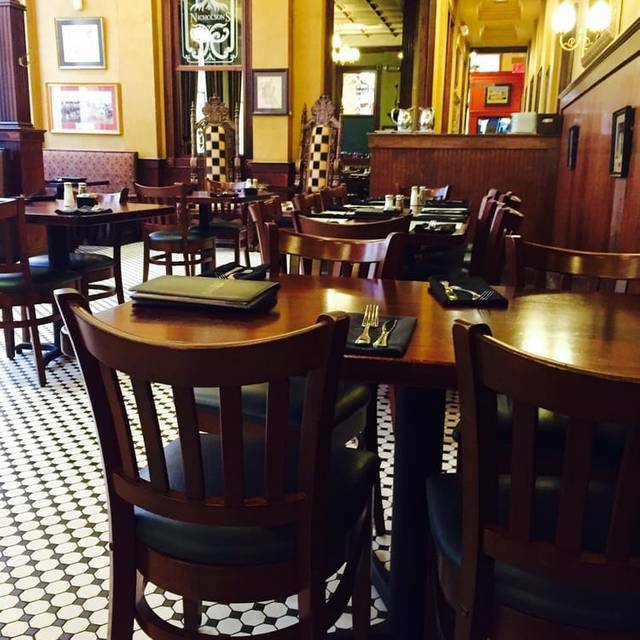 You must make reservations at least 5 minutes in advance of the time at Nicholson's Tavern & Pub. The valet is available every Friday and Saturday night at 6:00pm and Tuesday through Sunday on Aronoff Theater event nights. Price is $12.00. Join us for our 20th Anniversary Burns Night celebration on Thursday, January 25th @ 7pm. Call 513-564-9111 for reservations or email events@dinetrg.com to inquire about our premium ticketed event! Nicholson’s is located directly across from the Aronoff Center for Arts. Our 7500 square foot restaurant houses a series of individually decorated dining rooms. The expansive pub with its 16 ft ceiling is a great place for your next Happy Hour. The Hearth Room with its own working fireplace seats 32 or reception style 40.The Garden Room is bright and airy and has an attached patio, seats 50 or reception style 70. You can reserve our entire restaurant, 150 seated or 250 reception style. Some of our specialties are the Fish and Chips, Center Cut Pork Chops, Grilled Steak and Duck Fat Fries, Pan Seared Scottish Salmon with Caramelized Brussel Sprouts. Detailed mahogany and brass, antique glass and light fixtures from Scotland create an impressive and inviting atmosphere. 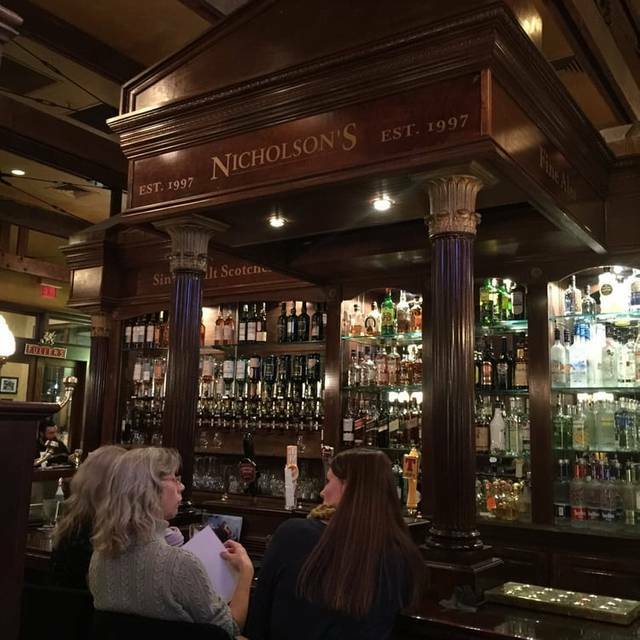 Nicholson’s has the largest selection of Single Malt Scotch in the region and over 25 imported beers on tap. We are a great destination for your next rehearsal dinner, graduation, business dinner or birthday party. 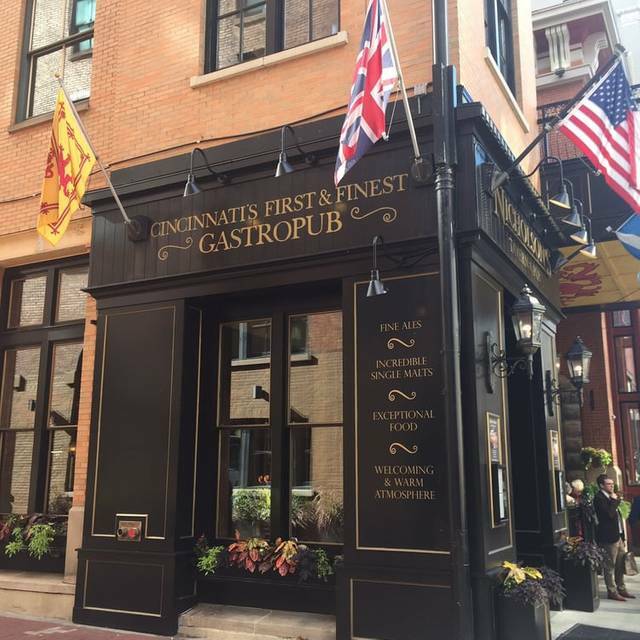 Located in downtown Cincinnati across from the Aronoff Center, Nicholson’s is a restaurant and bar serving fine food and drink in a genuine Scottish tavern setting. Taking inspiration from the public houses found throughout Great Britain, our goal is to provide our guests with authentic hospitality and a brilliant dining experience. 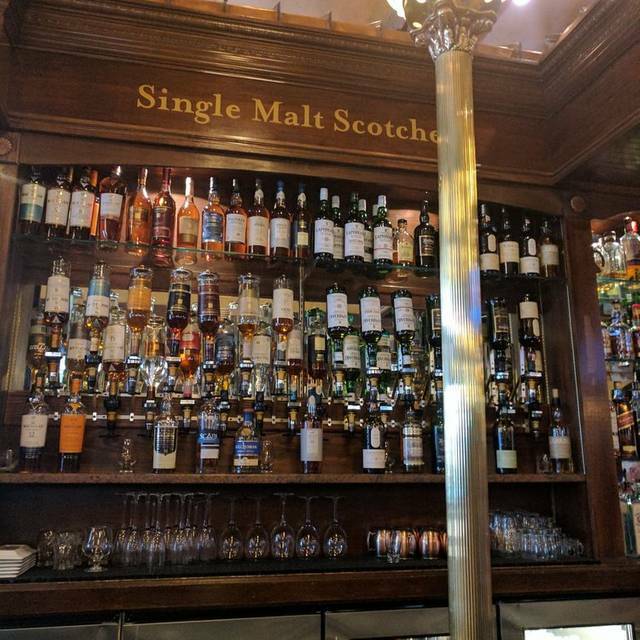 In addition to high-quality food, we offer a wide variety of beer, wine, and spirits featuring one of the best selections of single malt scotch whiskies in the area. Our family of restaurants has grown in recent years to include two new concepts: Horse & Barrel Bourbon House and the Backstage Event Center located next door from Nicholson's Pub. 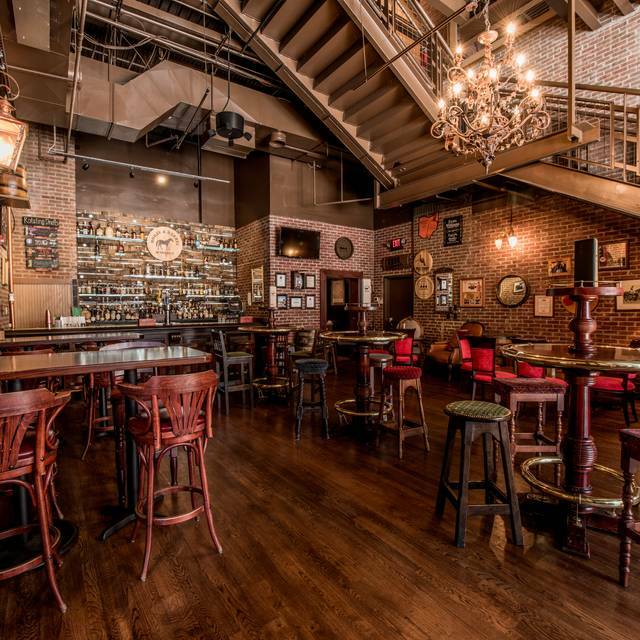 Horse & Barrel is an award-winning whiskey bar with 100+ whiskeys and bourbons, specialty cocktails, craft beers, small bites and a friendly bourbon-loving staff. The Backstage Event Center is a private event venue hosting rehearsal dinners, weddings, cocktail parties, corporate events and more. Love this place! We often eat here when we attend a show at the Aranoff. Great brunch experience. Always great service. Nice outdoor dining option as well. Been here many times and never been disappointed. Perry took wonderful care of us. Food was delicious. Overall food very good but the pork loin was dry and over cooked. Crab cakes and sweet potato’s where great. Great food. The duck fat fries were incredible! Ploughman’s board was nice—excellent mix of funky cheeses and other yummies. Bread was delicious. The shepherds pie was nearly all meat, and tasted great! Fifi, our server, was a delight. All in all, a wonderful time, and we would definitely go back. Food was great. Our server was not the friendliest and didn’t check on us very often. To be fair we were there for dinner before a broadway show. We were having brunch before our play at the Arinoff. Our food was delicious but our server was slow and made several mistakes on our bills. We ended up being rushed to make our play on time. Always wonderful service. Food is tasty. The evening was great. We had theater tickets and our waitress was aware. She brought us our drinks in a timely manner, food came out perfect at the right time. We did not feel rushed at all and were never neglected to where we had to flag down someone for service. Another beverage after dinner and dessert which was delicious afterwards. Look forward to next visit. We had a reservation, but the only table they had available was a high-top in the bar. We were there on a Friday evening before a performance at the Aronoff, so the bar and restaurant were crowded. My fish sliders were cold and we did not receive the appetizer and second round of drinks that we ordered. Would not go again, especially before the theatre. Delicious food, great atmosphere. Our waiter was fabulous and made the experience even better. As an added bonus ... kilts! The food was tasty, but the vegetables that came with the scallops was cold. Desert was very tasty. Good food at reasonable prices. Best fish and chips in town. Am always so impressed with Nicolson's! They never disappoint! Service, food, atmosphere - everything wonderful! Will be back again! We had a great time - good food, great atmosphere! My husband and I both got the fish and chips. My fish was almost burnt and my husbands fries looked like they were from two hours before. The coleslaw was very bland and not much. Not worth the $16 it cost either. We went in hopes of getting a Scotch flight for my boyfriend for his birthday. He loves it but doesn’t drink it often, so it was already an exciting time going into it. Mike, our waiter, loves Scotch just as much as my boyfriend, and we were blown away by his care and time he spent with us to make sure we got exactly what we were hoping for! We will definitely be back, and hopefully we’ll run into Mike again! Excellent food and really nice server - don’t know his name but he was from Warren MI! The kitchen was really busy so the food took a little while. Fortunately we were not in a rush. Fun decor and really nice people who work in this place. Very enjoyable evening. Waitress disappeared for long periods. Cold coffee. Fish sliders amazing! We had been here a number of times previously. It remains as good as ever. We actually tried to get a booking elsewhere, but it was the first home game for the Reds, and other places had no space. Nicholson's did, though it was pretty full. The food was quite good, the service was accurate and polite and accommodating, and the décor is great, especially to folks like us that love Scotland. 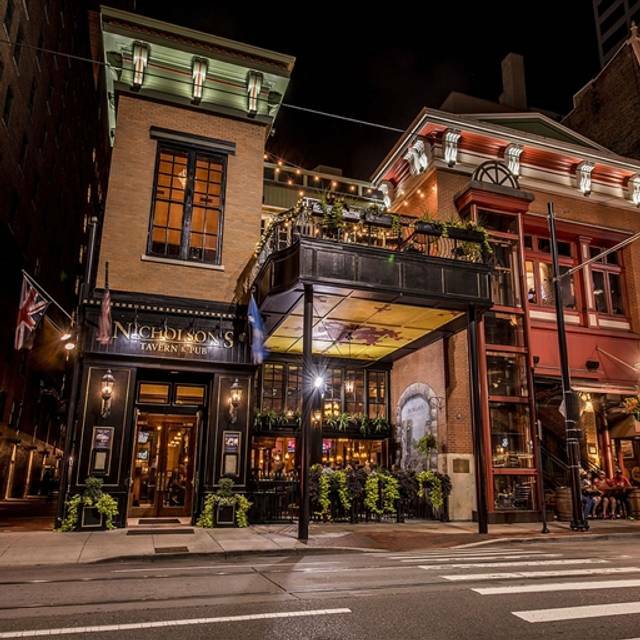 We paid a little more than we would at home, but downtown Cincy is a bit more expensive. Noise level was up during game time, but calmed down a bit by the time we left. 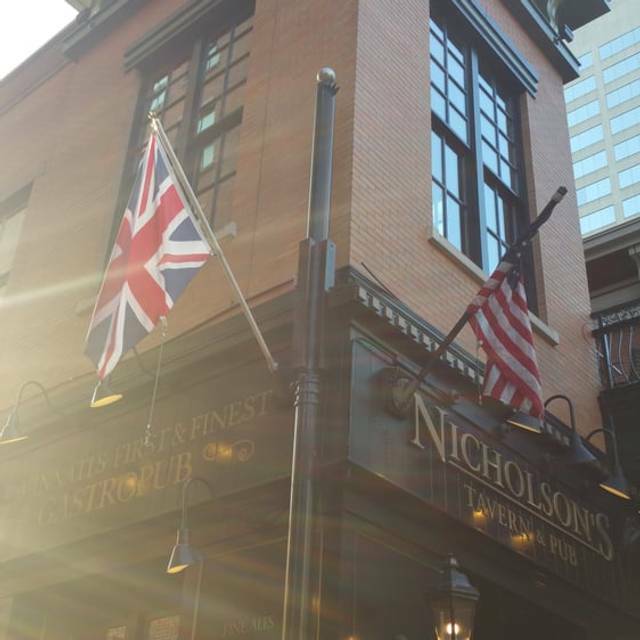 Overall, another great experience at Nicholson's. It is a great place to go before a show at the Aronoff. The service was spectacular and there is a nice selection of food. Consistently good food and outstanding service by Michael. Seemed shorthanded for waitstaff but food was great. Our food was wonderful, especially the Guiness stew and service was great! The food as well as the service were absolutely wonderful. Five of us for dinner. Some had good food and some said it was ok. Mine was ok. The server was a bit of a sourpuss - not friendly or personable really. We did go on St. Patrick's Day so really expected some fun and upbeat attitudes but not what we got - more ho-hum, another day another dollar attitudes. It was ok but Cincinnati has so many fun restaurants with great food AND great service that if a friend was asking I can think of a lot of other places that I would recommend first. Two of us had the shepherd's pie which was average - the flavor of the meat was good, carrots undercooked and potatoes fairly flavorless. It was sort of a "deconstructed" version - layer of meat with veggies around and potatoes on top but not completely covering as in a traditional shepherd's pie. One person ordered the Reuben and said it was very good. One person had the tenderloin and said it was very good and one person had the pulled pork and said it was average or a little better. Prices are fairly reasonable - drinks high as is the case anymore if you are drinking at a restaurant. $8.00 cabernet was meh. Switched to green beer, but they ran out of green food coloring - no biggie except for the lack of the St. Patty's Day fun element. Always a great time . Great food . Servers are attentive . Our family’s celebration place . Strongly suggest fish and chips. 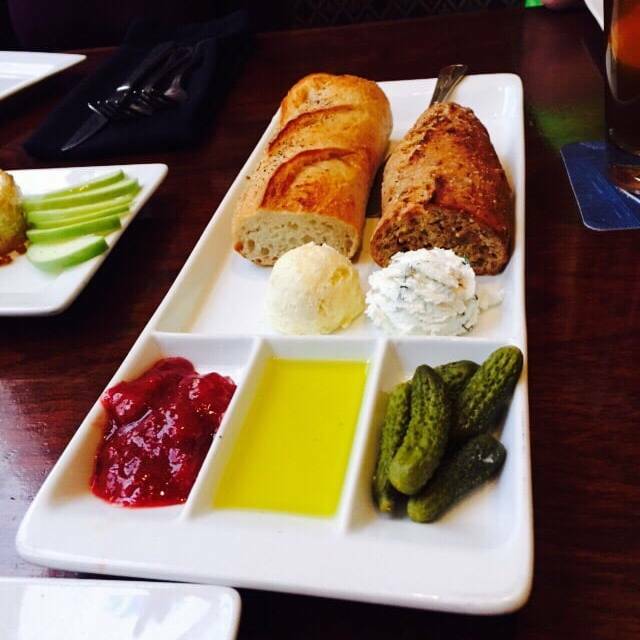 Appetizers are a meal themselves . Everything was great... once we got into the back room. I had no idea there would be live music at 6pm, and was on day 3 of a migraine. They actually tried to seat us right in front of the band & I have no idea why, since the entire back room was practically empty! If I go again, I'll be wearing ear plugs. it was St. Paddy's Day Week-end, so to be expected. Would return again. amazing food and great service! 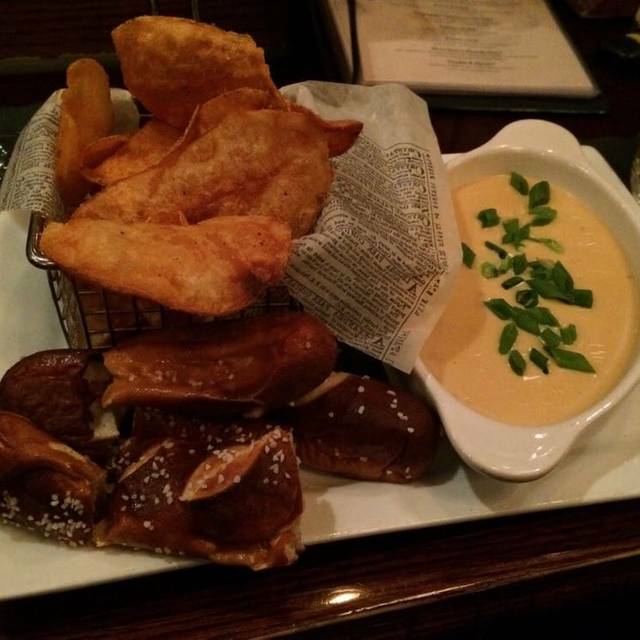 beer cheese was phenomenal! Good menu with a broad range of food from sandwiches to full dinners and "Pub" food. Conveniently located to the Aronoff so great for "theater" dates, which is what we did. Service was prompt and attentive.